Several states across the country are legalizing marijuana – currently, 21 states and the District of Columbia offer legalized marijuana in some form. Only two states, Washington State and Colorado, offer recreational use of marijuana, although use is very restricted to certain areas and purchase is restricted to certain shops. Other states offer restricted medical marijuana use, and even South Carolina passed a bill recently that allows for cannabidiol oil – made from the CBD compound in marijuana, rather than THC, which is the compound which causes intoxication – to treat severe medical disorders like chronic epilepsy. Although smoking legal marijuana may be ok in certain states, it can still have an impact upon your South Carolina professional license. While the DEA recently stated that they would not prosecute marijuana users too heavily, marijuana remains illegal at a federal level. Transporting marijuana across state lines even with a valid prescription is a criminal offense, so anyone who wishes to use marijuana recreationally must travel to either Colorado or Washington State. One of the major problems with marijuana, however, is that compounds from the drug can remain in the blood stream for up to a month. States that have legalized some form of marijuana have found the drug challenging during DUI stops – police officers must use their best judgment when discerning if the driver is high on marijuana or not, because a blood test will, in many cases, yield a positive result, regardless of whether the driver is actually driving while intoxicated or not. Sporadically-legalized marijuana also presents a problem with professional licensing, employment, and business litigation. In South Carolina, even a meritless claim filed with the South Carolina Department of Labor Licensing and Regulation (LLR) can result in a SC board investigation, placing your license and your reputation in jeopardy. Regardless of whether you must participate in a random drug testing, or you are forced to take a pre-employment or post-accident drug screen, if you have used marijuana in a legal setting in a state that has legalized its use, you may still face criminal drug charges in South Carolina as a result. You may also face a referral to the South Carolina Recovering Professionals Program (RPP). If you possess even 1 oz or less of marijuana, or have drug-using paraphernalia, you could face criminal drug charges. However, if you use marijuana outside of the state of South Carolina, for example in Washington State where recreational use is permitted, the high will wear off by the time you return home, but the compound will remain in your blood stream, and if you are tested for drugs for any reason – such as a professional licensing investigation – then you could lose your job or your business. Don’t wait until it’s too late. If you are contacted by an LLR investigator, you should contact the South Carolina professional licensing defense attorneys at the Strom Law Firm, LLC for a free consultation to discuss your legal rights. Even a public reprimand can cause severe professional damage including the loss of clients as well as existing and future job opportunities. 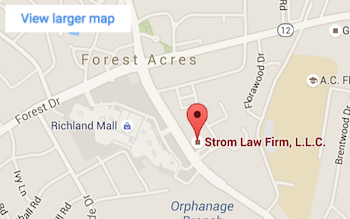 The Strom Law Firm’s attorneys understand that your business is important to you, and can help with legal questions surrounding legalized marijuana, alcohol consumption, or other professional licensing investigations. We offer free, confidential consultations to discuss the facts of your case, so contact us today at 803.252.4800.